Didn’t I tell you? I told you the Neo-Marxists were going to foment more violence. So Saturday they got all fired up and held massive demonstrations in various cities across the country against what they imagine Trump’s immigration policy to be and in favor of open borders, child trafficking and national collapse. 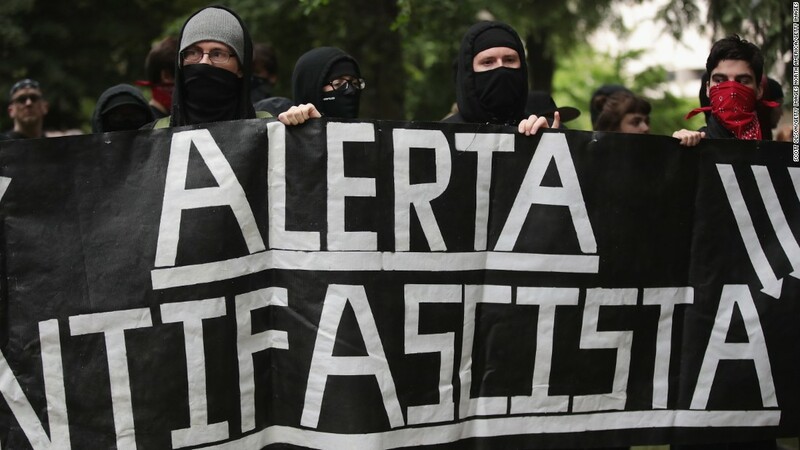 In Portland about 150 counter demonstrators called fie on them and were duly assaulted by about 300 self proclaimed AntiFascist hooligans. You see the results below. See what I mean by STAY AWAY FROM CROWDS? You will note that the police are notable by their absence. I grant that as riots go it was kind of tame, but it is clear that neither side was really organized or prepared for what happened. It is what is called a ‘Meeting Engagement.’ The Patriots just wanted to say “We support borders and want the invasion to end.” The AntiFascists just wanted to say, “Shut up or else!” The Patriots said, “Uh-UH! You and what army are gonna make us?” and the scuffle was on. Both sides seem to have been surprised at the outcome: the AntiFascists that the Patriots not only refused to back down but rather advanced on them, and the Patriots that they drove the AnitFascists from the field. Next time they will be more prepared and the Patriots will be at a disadvantage. Why? Because the Marxists are better funded, and will be receiving better training and organization. I’m sorry to say, but getting Patriots to act together is like herding cats. These Patriots did OK, but they, and we, will have to do better if we hope to hold our own and triumph in the coming unpleasantness. This is just a little taste of what’s coming. These people will not go down without a fight. They have spent their lives undermining us, you and me, to enrich themselves at our expense. In November of 2016 they believed themselves to be on the cusp of winning it all. Then we had an Act of God in the election of the unlikeliest candidate, Donald Trump. Now they are on the brink of losing it all, and they will not go quietly into that goodnight. There is no way to sugar coat it. We have our nation to preserve, and each must to his utmost to achieve the victory in whatever field of action he can manage. President Trump is carrying the aspirations of all true Patriots, and he is doing his part. As much as what we have seen him and his Administration do and accomplish there is much, much more going on behind the scenes. The Commiecrats know it and are doing all they can destroy all those Patriots working to set America to rights. Consider this chart (click to enlarge). Normally there are just over 1,000 of these kinds of indictments every year. Look at the number in the yellow highlight. There’s a mighty judgement coming, and some will find it not at all to their liking. We each have out part to play, and there is much to do. Right now we are five months away from the midterm elections. It seems like a long way away, but it isn’t. We must prepare. I hope to have an announcement about the Republican Club of the Foothills next week. The Club exists, EXISTS! precisely for these kinds of moments. We will be ready, we will be prepared, and we will act. We shall brace ourselves to our duty and carry it out, for ourselves and our posterity with the help of God. Hi! I was happy to call this anti-American crowd Stalinists, but I really like “Comicrats. Please recommend to your friends to go to CraigHuey.com for the voter guide. Then they should pass it onto all their contacts.